For those who tuned in on Saturday morning for my local long run, here’s the map of the route. 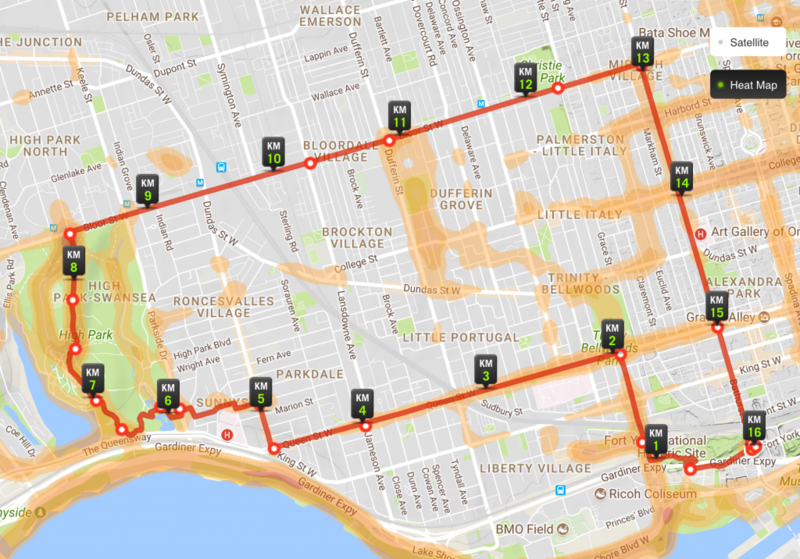 I’m currently training for my second half marathon and know how many people love to travel to Toronto around this time — perhaps to participate in the Scotiabank Marathon themselves. So in addition to the five scenic routes I already created for Tourism Toronto, I decided to create a longer bonus route for those in training mode. Starting at the historical site of Fort York, I ran through to Strachan and then up to Trinity Bellwoods. There happened to be a fun arts market, but any weekend is a good weekend to take a detour and stroll through. From there I continued west along Queen Street, hitting must-visit pockets like Parkdale. Queen West ends at Roncesvalles, which is also a fun strip. But instead of going north there, I decided to enjoy a little nature and run through High Park. Once I hit Bloor Street, I turned back east to make a pit stop at Hodo Kwaja, the best spot for some Korean walnut cakes in K-Town. It was just a short distance to Bathurst, which I headed down to browse through Kensington Market quickly before stopping at Toronto’s first shipping container market, Market 707, on Dundas for a quick refreshment. Before I knew it, I was back on Bathurst heading south to Fort York, finishing a solid 16km run. It’s so great being able to explore Toronto on foot. And if you decide to run, you get to see even more! Long runs are meant to be taken nice and slow, which is ideal when checking out a new city this way.